Northwestern has been the Big Ten’s surprise again this year with a 4-1 start and a buzzed crowd packing in Ryan Field for this highly anticipated football event. 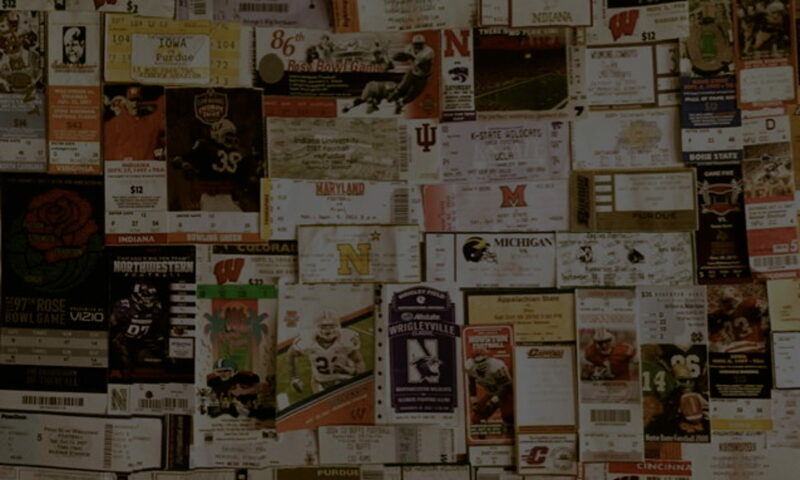 Wildcat fans hoped that this would not be a historic evening for Coach Paterno, but many fans from Pennsylvania journeyed to Chicagoland to see if their hero would claim the record tonight. 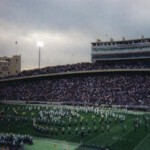 The Lions took the field in demanding fashion as their band pounded “Fight On State.” A perfect autumn evening blanketed Evanston, Illinois as the game began. 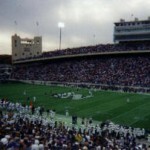 Each team traded punches from the opening kickoff. Penn State finally located their offensive artillery at the ideal time – against Northwestern, a team that depends on their high-flying point-making machine. The Nittany Lions led 31-28 with just over two minutes left when the Wildcats scored to take the lead 35-31. 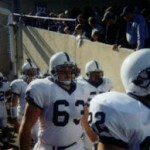 It looked as though the home team would keep Paterno one win shy of the record. But, the gritty group from State College, PA put together a championship-like drive that culminated with a four-yard touchdown pass from Zack Mills to Eric McCoo with 22 seconds hanging on the clock. Northwestern was unable to recover from that blow and the Penn State players carried Joe Paterno off the field tied for the winningest coach in college football. 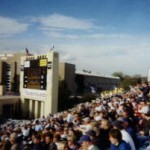 Penn State fans celebrated long after the game to celebrate the milestone. Every year, when Paterno is asked how many more years he has in him, he replies with, “about five years.” I think he is losing validity. 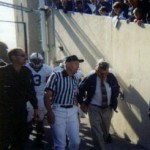 Joe Paterno leads his team out. Lions driving on the Wildcats. Nittany Lion fans and band. Penn State band performs at half. 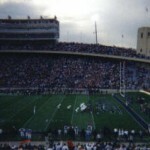 Penn State prepares to score.